I was browsing the book selection at the Harvard Coop a few weeks ago for a graduation present and came upon this little gem. 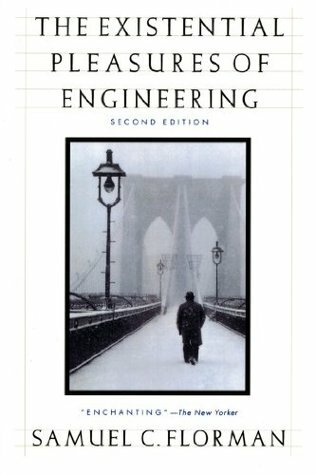 The Existential Pleasures of Engineering by Samuel C. Florman is a book about the engineering profession, how it came to be, where it is now, why its important, and just what makes it special. The title in particular is what caught my eye because when I thought about it I couldn’t think of better words to describe what I feel when I’m doing meaningful engineering work. To put it another way, I enjoy my work not because it’s easy but because the act of creatively solving complex problems is intrinsically rewarding to me. On the inside, it was Florman’s timeless insight into the issues that face our profession and where we stand in society that kept me reading. It taught me a lot about my professional responsibility to society and gave me a greater appreciation for the work we do. Hands down, I strongly suggest this book to anyone passionate about engineering. It starts out talking about the rise of our profession and the golden age of engineering to really hook the reader in. This golden age being the period of time between the 1850’s to the 1950’s where we began to see the completion of macro-scale engineering works. You get a sense of how young and naive the profession is compared to the institutions of business, law, and medicine. That’s not to say that engineers haven’t existed for thousands of years, but rather the institutions of the profession is still in its infancy which is one of the main themes of the book. Because the institutions are weak, engineers are unable to truly fulfill their duty to serve society. The second part then goes into a long discussion on the claims of anti-technologists, in other words the people against the wide spread application of engineering solutions. They argue that the rise of technology has not only decreased the quality of human life but in many ways made it worse. Further, they argue that it was the engineers that brought this on society. Their argument primarily centers on the negative externalities of technology such as pollution or the creation of powerful weapons and the idea that old simple lifestyles of the past were inherently better. Fact of the matter however is that the fault lay not in the engineer, but the choices made by society which are more often than not poor in judgment. Sad thing is that these beliefs have gained much traction with society because the arguments are so plainly laid out in language that’s easy to relate to and understand. Due to the naivete of the engineering organizations we have not mastered the organizational skills to mold the sentiments of society. While a politician can empower a nation to spend billions of dollars to land a man on the moon, engineering institutions can barely lobby enough funds to maintain critical infrastructure. For our profession to be successful in our mission to serve the people, we must be able to take a unified stance on issues and address the anti-technologists. Florman then ends this piece on suggestions for the engineering profession and the adoption of an existential philosophy. A philosophy that hinges on the idea that engineers choose the profession because they find interest in conquering the natural world. What makes engineering special is that we don’t choose the profession for prestige or materialism. If that’s what we wanted, we would’ve taken up another profession with just a fraction of the effort. However, the psychological rewards of engineering are far greater in value to the individual who pursues them. How this applies to our profession is that it’s not really an ethical guideline but rather a contract to take pride in our work. We are to be professional in our conduct, in that we must deliver the best we can based on all possible considerations given the resources available. A good existential engineer must be well aware of the consequences of his/her actions and must be willing to take responsibility for them (Whereas other professions excel at placing blame).